Background. Gemcitabine and radiotherapy are a potent combination. A clinical assessment of the therapeutic ratio for locally advanced pancreatic cancer patients has not yet been reported. Aim of Study. To assess the toxicity, survival, and pattern of failure of locally advanced pancreatic cancer patients treated with concurrent gemcitabine-based chemoradiation. Patients and Methods. 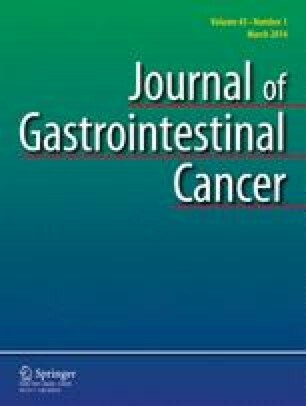 Between the dates of December 1996 and August 2000 51 patients with locally advanced unresectable adenocarcinoma of the pancreas were treated with concurrent gemcitabine and radiotherapy at MDACC. Patients received 250–500 mg/m2 of gemcitabine weekly ×7 over 30 min and 30–33 Gy in 10–11 fractions over two weeks to the primary tumor and regional lymphatics. Severe toxicity was defined as admission >5 d, mucosal ulceration, >3 dose deletions of gemcitabine or toxicity resulting in surgical intervention or that resulted in death. Results. The median survival was 11 mo. Overall, 37 of 51 patients had objective evidence of local progression. The actuarial rate of local progression rate at 9 mo was 70%. The 9-mo distant metastasis rate was 52%. Tumors ≥ 10 cm2 had worse local control, distant control, and overall survival. Six patients underwent pancreaticoduodenectomy after therapy. After review of the imaging, only four of these patients had minimal arterial involvement, one was incorrectly staged, and one had initial inflammatory change on CT that resolved. Twelve of 51 (24%) patients suffered severe acute toxicity, and 17 of 51 (33%) patients were admitted for supportive care. Conclusion. Concurrent gemcitabine and radiotherapy can be a very difficult combination to administer safely. Our results do not suggest a prolongation of median survival for patients with localized pancreatic cancer treated with this therapy. It is possible that gemcitabine-based chemoradiation contributes to the margin-negative resectability of a small number of patients with minimal arterial involvement, but this benefit is obscured by the frequent toxicity encountered in most patients. Locally advanced pancreatic cancer patients should continue to be enrolled on prospective studies investigating novel combinations of cytotoxic and/or biologic agents with concurrent radiotherapy.